enough to support the curtain with an ample factor of safety. A lowstress torsion spring counterbalance of proper capacity to balance the curtain in all positions is built into the roller. Main bearings for the curtain roller are flange-type heavy duty ball bearings that make operation smooth and friction-free. These bearings are lifetime lubricated and sealed. 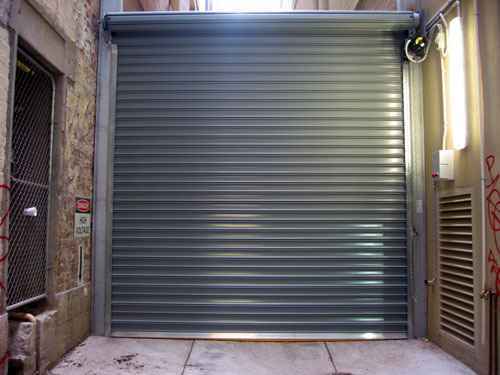 As manufactured by The City Gates Mfg. Corp., College Point, N.Y. shall be of service type and operated by means of either manual push-up, endless chain or motor. Preparation of openings, structural supports, access panels, trim, field painting. 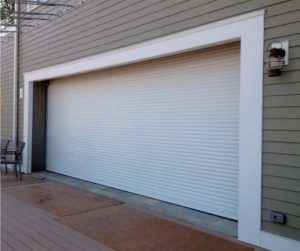 On motor operated doors, exclude wire, wiring or disconnect switches. to consist of helical torsion springs with a 25% safely factor, mounted on shaped cast anchors, supported by a continuous solid torsion rod. This mechanism to be permanently lubricated and enclosed within a steel pipe shaft , Deflection of shaft not to exceed .03″ per lin. ft. The spring tension adjusting wheel is to be readily accessible from outside the bracket plate. to be not less than 1/4″ thick steel plate, to contain self aligning ball bearings for suspension of the counter balance assembly. Brackets to be mounted to the structural wall angle to form a self supporting member, and form an enclosure to the hood. Brackets to be reinforced with welded steel bands for support of hoods. Gears to be of high grade iron, cast from machine cut patterns. 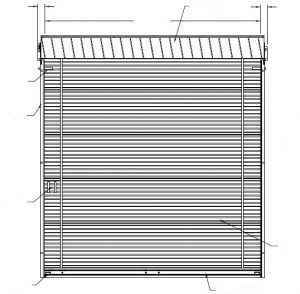 To be composed of structural (steel) (aluminum) (stainless steel) angles, minimum 3/16″ thick, of sufficient depth to retain curtain under normal wlndload. 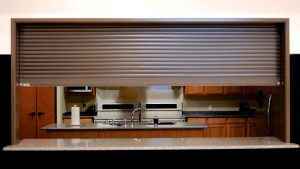 For doors requiring windlocks, guides to be provided with windlock bars. Guides to be assembled with 3/8″ diameter bolts spaced not over 3′-0″ on centers. 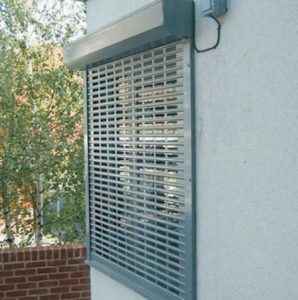 to be not less than #24 gauge (hot galvanized phosphate treated steel) (aluminum) (stainless steel), formed to fit brackets, and reinforced top and bottom with stiffening returns, with intermediate hood supports where required by door width. provision for padlocks to be (slide bolts on push up doors) (chain holder on chain doors) (locking disc on crank doors) (self-locking gearing onmotor operators). on steel to be one shop coat of rust inhibiting metal primer, except on galvanized surfaces. On aluminum, finish to be mill. On stainless steel, finish to be 2B mill.